I cringe when someone tells me “I don’t have a creative bone in my body.” If you weren’t creative, you would have no bones… you’d be dead. Anyhow, the older I get, the less impressed I become with originality. These days, I’m far more moved by authenticity. Attempts at originality can often feel forced and precious, but authenticity has quiet resonance that never fails to stir me. We express our individuality from the inside out. Children naturally grab what’s in their environment and run with it! They do what the like with no thought of what others will think of it. 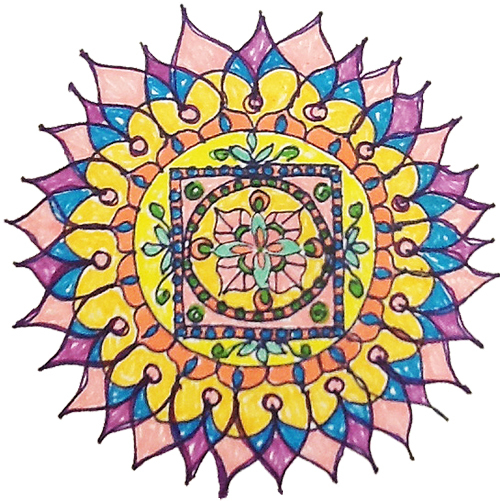 Creating a mandala allows you to express with abandon. No kidding. Your inherent creativity needs to expand. If you’re not creating you’re dying, It’s that simple. Creation is freaking amazing, and I am part of it! There is no truth to the statement “I don’t have a creative bone in my body.” If you think that then the jokes on you — you wouldn’t HAVE a bone in your body, you wouldn’t HAVE A BODY. 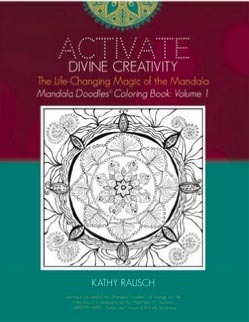 Creating mandalas opened up my creative energy and helped me grow out of a deep depression to a fulfilling, happy and healthy life. EVERY LIVING BEING and every “thing” began with an elegant act of creation. Creation is freaking amazing, and you are part of it! Every day. Every moment. Every thought. Every breath. Every interaction. Sadly, many people think that if they can’t pick up a paintbrush and paint a masterpiece, they’re not creative. We don’t appreciate how simply being live requires creativity. …creative entitlement simply means believing that you are allowed to be here, and that—merely by being here—you are allowed to have a voice and a vision of your own. …there is no stopping the creative force that is within each and every one of us No stopping it. It is yearning to be expressed. I fear we’ve lost our ability and drive to be spontaneously creative. We don’t have to be. We can sit around on our asses all day if we choose. Your creativity is like a muscle, the more you use it the stronger it becomes. You can actually become more creative by changing your mind-set. Anyone can innovate, if they choose to. Disruptive innovators do it by choice, not chance. Their everyday actions swap out an “I’m not creative” mind-set for an “I am creative” one. And then magical (not mystical) things unfold. Expression is endless and unavoidable. If you have any trepidation about the mandala, realize that every flower is a mandala and a perfect representation of the miracle that YOU are. Making a mandala is a universal activity, a self-integrating ritual. The mandala is a map for spiritual transformation. Sometimes ‘mandala’ is translated as ‘essence container’, a phrase that hints at its psychological and mystical meanings.